Orifice Flange helps to measure the flow of liquids and gases using orifice meters located on the outside diameter of the flanges. 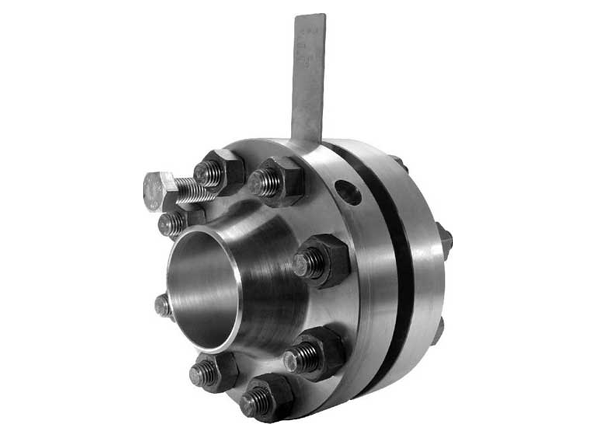 The main purpose of the orifice flange identifies the flow rate of either liquid or gas in the pipeline system. It comes with either raised faces or RTJ facings. Each orifce Flange come in contact with two pipes taps for measuring the pressure drop of the flow through an orifice plate. The range of orifice flange covers all standard materials, size, grades and specification. JF Engineering is the best organization of providing the best qualitative product at a reasonable rate. Orifice Flanges are available in ANSI classes 300, 600, 900, 1500 and 2500 in varieties of materials such as stainless steel, carbon steel, alloy steel, monel and Inconel. JF Engineering Products LLP is Manufacturer, Stockists & Supplier of premium quality range of Orifice Flanges, Stainless Steel Flanges & Other Stainless Steel Pipe fittings that are manufactured under the expert guidance of our diligent workforce. We are highly experienced company in Orifice Flanges & other pipe fittings. our Orifice Flanges & Other Fitting products are manufactured using quality material and go through a rigorous quality check at all stages of production to ensure quality. Various steel products such as Angles, Channels, Beams, Billets, Blooms, Round Bars, Square Bars, Rectangular Bars, Flat Bars, Forged Bars, Rolled Bars, Concast Bars, Pipe Fittings, Elbow, Tee, Reducer, Cross, Stub End, End Caps, Forged Stampings, Pipes, Tube, Tubing, Fasteners, Bolts, Nuts, Washers, Screws, Studs, Plates, Sheets, Coil, etc.